Barnacle Rock is time-travelling through poetry. 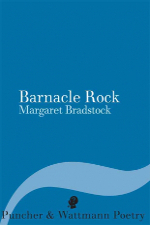 Its significance lies in Margaret Bradstock’s successful inscribing of a journey, from the search for a land of plenty by various explorers, to the position we find ourselves in now: a climate in crisis, a civilisation in error and a country which has displaced its indigenous people, replacing their knowledge with a rusted ‘progress’. Dense, a rich read, it alerts the mind into awareness.